Celastrus has a big family of 22 members and they are widely distributed in the Southwest, South China and Northeast China. They all look alike and often make people mix them with one another. Only experienced plant researchers could tell their differences. Generally speaking, celastrus can grow as long as dozens of meters; their stalks are as thick as human arms, and often climb up very high with the support of tree trunks and stones. When they stick themselves out, they begin to stretch their branches and to strive for sunlight with other plants. In the rain forests of Xishuangbanna, there are various shapes and forms for them. Some of them entangle the tree trunks, or twist upwards along other trees; some jump to tall arbor trees from the ground or by hanging down from the air; some entangle by themselves into varies ties, and some sway to and fro in-between trees; they make people dazzling in front of them. There are two celastrus. 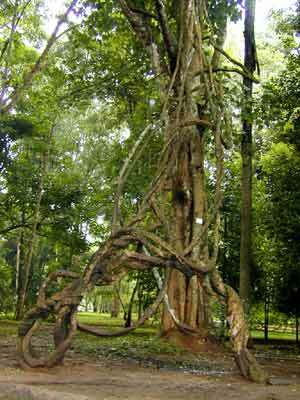 in the Park of Trees, they are as thick as 20 cm and as long as dozens of meters; they entangled with each other and formed shapes like rings and swings. They climb up tall trees and entangle together with each other, and so they are often called �the husband and wife vines� by common folks.